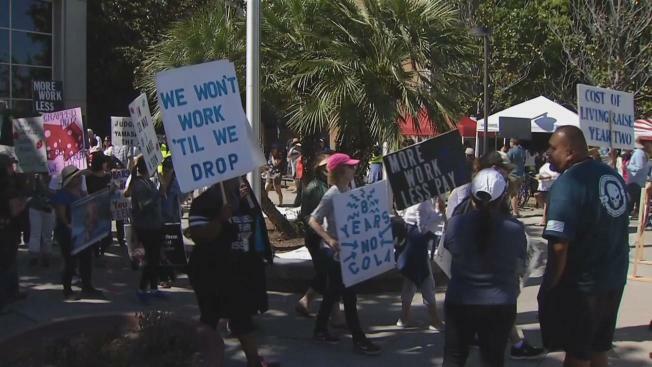 Court clerks returned to the picket line Monday at the Hall of Justice in San Jose, and their was seemingly little progress in their fight for more pay and staffing. The clerk's offices were shut down, as were many of the courtrooms, continuing to delay cases and testing the patience of those who do business at the courthouse. "Yeah, it's frustration," said Steve LaMar, who is awaiting the already prolonged trial of his daughter Sierra's accused murderer, Antolin Garcia Torres. "Even though it looks like we're patient, we're still frustrated with the whole thing. And this is kind of adding to the frustration of course." Garcia Torres' trial barely got started last week before the strike began. It has been delayed until Aug. 17, officials say. Attorneys again described chaos inside the courthouse, including cases of inmates charged with violating probation Who must have their day in court within 10 days. "I had four defendants on my calendar and none of them were brought over to court," said Max Zarzana, president of the Government Attorneys Association. "So all of those arraignments had to be out over to Thursday, which I think for all of them is the 10th day or else they get out of custody." The Sheriff's Office said it is transporting only the inmates it is ordered to move. "The ones that weren't transported, we did not have the paperwork to transport them," said Sgt. James Jensen, sheriff's office spokesman. Court management said it fulfilled court services Monday and also called for mediation. The court has offered, essentially a 9.5 percent raise, with no raise in the second year. Union leaders said they will go to mediation if negotiators are authorized to add a raise in that second year.